Dubai; January 20, 2019: Dubai Gold & Jewellery Group’s (DGJG) ongoing promotions for gold and diamond jewellery is acting as a major catalyst to increase the shopper participation for the running Dubai Shopping Festival. With over thousands of participants in the first 24 days of the promotion, the group has received a magnificent response from both residents and tourists alike. Till now, DGJG has given away 24kgs of gold and 3 BMW cars to 99 lucky winners. The third weekly draw on the 19th of January was graced by Mr. Fattallah Abdullah Fattallah, Manager, Dubai Economic Department, Mr. Vince Cook – CEO, National Bank of Fujairah, Mr. Chandu Siroya – Vice Chairman, Dubai Gold & Jewellery Group, Mr. Shamlal Ahmed –Managing Director, Malabar Gold & Diamonds, Mr. John Paul Alukkas – Executive Director, Joyalukkas Group, Mr. Tomy Joseph – General Manager, Dubai Gold & Jewellery Group. Each year DGJG have come up with innovative promotional campaign to boost the jewellery sales, thereby giving astonishing opportunities to the shoppers to shop and reward themselves with mega prizes. DGJG has been playing an important role in enriching DSF's events by offering spectacular prizes and has helped turned around the lives of many lucky winners. As a testimony to DGJG’s commitment to promote Dubai as the City of Gold, the promotional campaign will see over 300 jewellery retail outlets across Dubai coming together to host the first of its kind DSF promotions. 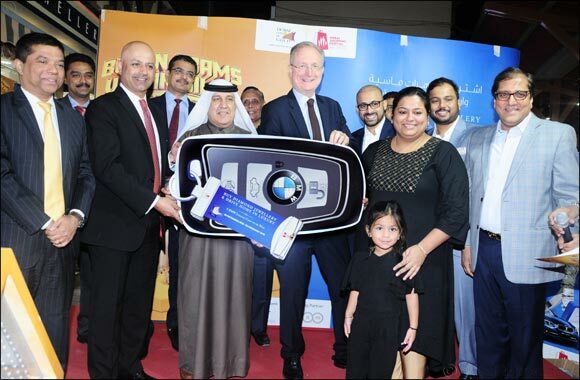 National Bank of Fujairah (NBF) being the official banking partner of this campaign has added to the shopping excitement by doubling the chance of winning a BMW. Shoppers are entitled to get two coupons instead of one to participate in the diamond raffle draw, on a minimum spend of AED 500 using NBF debit or credit card. Dubai Gold and jewellery industry is one of the very few industries that unite under one umbrella to offer such grand promotions consistently for the past 24 years. The group has given away more than 900 kilograms of gold over the last 23 years, more than any other establishment in the world.